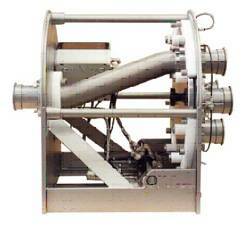 For diverting powders and granules from one line, up to any of sixteen lines, Nu-Con has the solution. Flow can also be converged from multiple lines into one line. The Multi-Way valve can be used as a gravity divert valve, allowing a single product stream to be diverted to a number of different destinations, very useful when height is an issue on top of a segmented silo for instance. Or in a pneumatic convey line these valves are often used instead of a series of two-way valves, thereby simplifying the system, and reducing maintenance. All usual line sizes are available from 50mm up to 400mm diameter. The number of discharge ports can vary from two to sixteen ports per valve. Stainless steel and carbon steel construction. 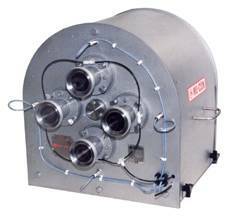 Nu-Con have these valves installed in hundreds of applications, such as conveying milk powder, carbon black, woodchips, diverting coffee powder and even bank notes.